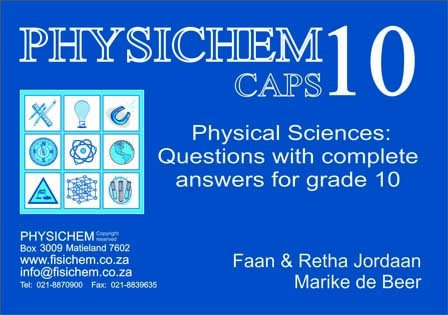 Physichem 10 (CAPS) covers the entire syllabus in 13 chapters. In these chapters we first address the most basic aspects which learners should master. Where applicable, we also revise content from earlier grades. A good mix of different types of questions is used to assess learners’ knowledge, skills and other abilities. We tried to arrange the questions in such a manner that they become progressively more challenging. COMPLETE ANSWERS to ALL these questions are given in the second half of the book.